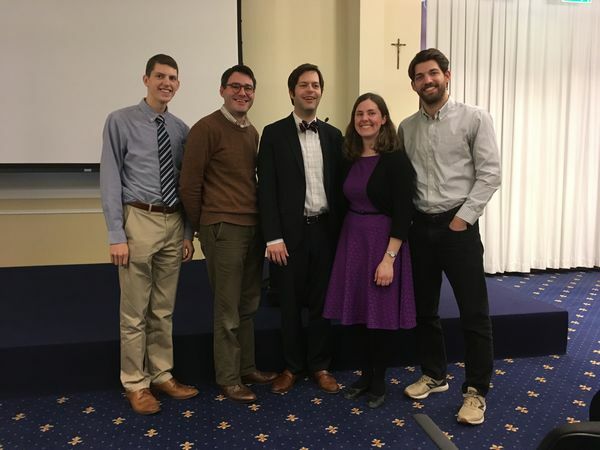 Over winter break, four Notre Dame graduate students and alumni attended the 2018 session of the Winter School in Latin Paleography and Codicology offered by the American Academy in Rome in collaboration with the Biblioteca Apostolica Vaticana (BAV) and the University of Notre Dame Rome Global Gateway. The session ran from January 8-19th and was for the first time led by Dr. David T. Gura, curator of ancient and medieval manuscripts at Notre Dame. This two-week intensive course consisted of lectures on paleography and codicology led by Dr. Gura, time for each student to study a manuscript at the Vatican Library, and presentations from students on the manuscripts they studied. From left to right: Joshua Benjamins, University of California, Berkeley (MA in Early Christian Studies, 2017); Erik Ellis, University of Notre Dame, Medieval Institute (MA in Classics); Dr. David Gura, University of Notre Dame (Curator, Ancient and Medieval Manuscripts); Kate Van de Loo, University of Notre Dame, Department of Classics; John Izzo, Columbia University (MA in Classics, 2017). About this new collaboration Medieval Institute Director Thomas E. Burman remarked, "The Winter School not only gives Notre Dame's graduate students another way to gain experience in working directly with medieval manuscripts, but furthers Notre Dame's valuable partnership with the Vatican Library. It also helps make the Medieval Institute's reputation as a center dedicated to careful paleographical and codicological education even better known internationally." Adapted from an article published on classics.nd.edu on January 25, 2018.